The coast redwood (Sequoia sempervirens) is the sole living species of the genus Sequoia in the cypress family Cupressaceae. Common names include coast redwood, California redwood, and giant redwood. It is best known for being the tallest living tree, and among the largest living trees overall. It is an evergreen, long-lived, monoecious tree. This species includes the tallest extant trees on Earth, reaching up to 379 feet (115.52 m) in height and up to 26 feet (7.9 m) diameter at breast height. The roots are shallow in the ground and spread widely. Its bark can be up to a foot thick, soft and fibrous, and reddish-brown when first exposed; this is where the redwood gets its name. The bark becomes darker with time. Leaves may be up to an inch long, but in direct sunlight are smaller and scale-like. Seed cones are up to one and a quarter inches long and contain up to seven seeds, each of which has two wings. Seeds are tiny, weighing 3.3 to five milligrams, and possess two wings. These descend to the forest floor and germinate. Most seedlings do not survive their first year; however, those that do begin to grow very quickly, attaining a meter per year. At this rate, they can grow to 66 feet (20 meters) in twenty years. At ten to fifteen years of age, they are sexually mature and begin producing cones. Overall, a coast redwood may live for 1,200 to 1,800 years or more. The coast redwood is not sexually dimorphic. It is monoecious, meaning that the male and female reproductive structures (the pollen cones and seed cones) exist on the same plant. Before commercial logging and clearing began by the 1850s, this massive tree occurred naturally in an estimated 2,100,000 acres (8,500 km2) along much of coastal California (excluding southern California where rainfall is not abundant enough) and the southwestern corner of coastal Oregon within the United States. They are more common in mountainous areas near the coast, where they benefit from precipitation coming off the ocean. Older and larger trees can be found in valleys, living off of rainfall and fog. Coastal fog benefits them, but salt spray and sandy soil keeps them from growing too close to the coastline. The environments where these trees grow is perpetually damp, and they have a very large need for water. These trees are not normally found on Isla Nublar, but as of 2015, T. rex Kingdom had a redwood environment with trees that were probably artificially introduced. It is not known for certain whether these are S. sempervirens or a de-extinct relative. It is likely that, without human intervention, these artificially-introduced redwoods began to suffer in their contained environment. The June 23, 2018 volcanic eruption of Mount Sibo likely destroyed the remaining trees, either directly (by means of lava bombs or pyroclastic debris) or indirectly (by depriving the trees of essential nutrition). 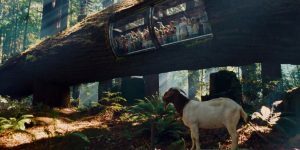 Even if any survived thanks to the shelter of T. rex Kingdom, the lack of animals to provide nutrition into the soil and the absence of human maintenance would probably have resulted in the eventual death of all remaining redwoods on Isla Nublar. 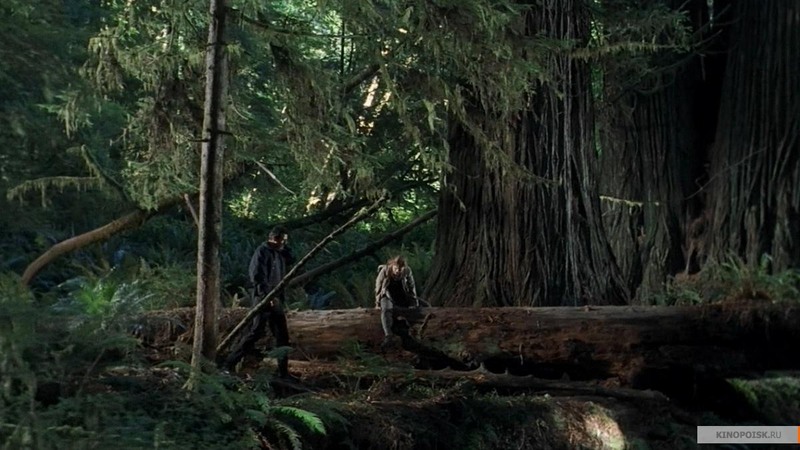 On Isla Sorna, there are redwood forests in the higher-altitude parts of the northeast. They were observed by Drs. Ian Malcolm and Sara Harding in May 1997. Redwoods are also present near the central region of the island, north of the Workers’ Village. The coast redwood takes in carbon dioxide during the day; it utilizes energy from sunlight to convert carbon dioxide and water into carbohydrates. Its activity slows at night. Attaining enormous size permits the coast redwood to tower over other trees, gaining sunlight that it uses as energy for photosynthesis. It has very large water needs, so it must grow in areas where it has ready access to fresh water. Carbon dioxide is taken in through the leaves and combined with water to create carbohydrates. Oxygen is produced as a waste product. Redwoods grow in large forests, and may have some limited degree of chemical signalling with one another. When the plant reproduces asexually, the younger trees are stimulated to grow when the main “parent” trunk is damaged. There are three methods by which the coast redwood can reproduce. The most studied is traditional sexual reproduction, in which pollen (produced by pollen cones) fertilizes the larger seed cones. The cones begin developing during the winter, and are mature by autumn. Seed cones, once fertilized, can produce between 90 and 150 seeds, and a freshly-matured tree can produce thousands of seed cones in a season. However, most of the seeds are not viable; only 3% to 10% of the seeds are fertile and can grow into new trees. Wind may bear the seeds up to 390 feet (120 meters) away from the parent tree, where they will begin growing. Most seeds do not survive their first year, being eaten by predators. The survivors will rapidly grow at a rate of one meter per year, becoming sexually mature between ten and fifteen years old. Coast redwoods can also reproduce asexually. A tree stump, root crown, or even a fallen branch may start sprouting into a brand new tree, such as when a mature tree falls over. Sprouts burst from underneath the bark when the tree becomes damaged, creating a line of offspring that grow up from the body of the original tree. When a root crown or tree stump gives rise to offspring, the young trees occur in a circle often called a “fairy ring” centered around the stump or roots. These sprouts can grow up to 7.5 feet (2.3 meters) in a single season. The third reproductive method used by coast redwoods in real life is self-cloning from burls. A burl is a thick woody structure, a lignotuber, that grows on the roots up to ten feet (three meters) below the soil on the redwood. These burls develop from the axils of the seed-leaf in seedlings; this is exceedingly rare in coniferous trees. If the burl is damaged, sprouts will emerge from it; the burl can also grow into a new tree if it becomes separated from its parent. Because their offspring start out so small, and because the overall tree is so large, a coast redwood will have its greatest reproductive success after wildfires clear away smaller plant life. Many species of plants utilize chemical signals to communicate. Trees commonly use their roots to transmit these signals; there is some evidence that symbiotic mycorrhizal fungi may play a role in this communication. Specifics in the coast redwood are not known at this time. Redwood forests create a unique ecology because the trees use up most of the soil’s nutrients. As a result, they depend heavily on animal droppings and decomposition of dead trees to provide them with more nutrients. On Isla Sorna, the presence of large herbivorous dinosaurs would help these trees to thrive. Because of their size, redwoods provide habitats for dozens of smaller animals, including many birds, reptiles, and mammals. Redwoods are resistant to insects, rot, fire, and fungi, so they are usually undamaged by most ecological disturbances. Dinosaur species known to inhabit redwood environments include Stegosaurus and Compsognathus. Based on an older script of The Lost World, it is possible that the sauropod Mamenchisaurus could be found among redwoods. There is evidence of Tyrannosaurus rex activity near redwoods as well. No animals have been depicted feeding on these trees in the franchise, and the trees are likely too large to be significantly damaged by any other than the very largest dinosaurs. On Isla Sorna, the coast redwood is most likely an introduced species. It may grow wild on the island today, but considering the tree’s native range and reduced ability to disperse, it almost certainly arrived there by means of human intervention. 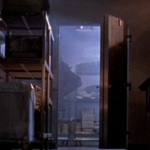 At least on Isla Nublar, the coast redwood or a similar related species was introduced as decorative plants in T. rex Kingdom to simulate the environment of western North America. In real life, coast redwoods are the most commercially valuable source of timber. They were logged extensively in the past, leading to their range being severely impacted. Because it lacks resin, it is very fire-resistant and therefore desirable in construction. Today, it is cultivated throughout its native range and the surrounding areas, as well as central Mexico, South Africa, Hawaii, Portugal, Italy, Great Britain, and Haida Gwaii. It is naturalized in New Zealand. In addition to their use for timber, coast redwoods can be tourist attractions because of their impressive size.